We got a "VIP" coach from Vang Vieng to Luang Prabang which took 6 hours was an ok journey over lots of mountains. We arrived and was not keen on our accommodation at all called Rattana. It was wooden and smelt damp and i actually saw a really horrible cockroach with wings type of creature in the room, which i was brave enough to get rid of. 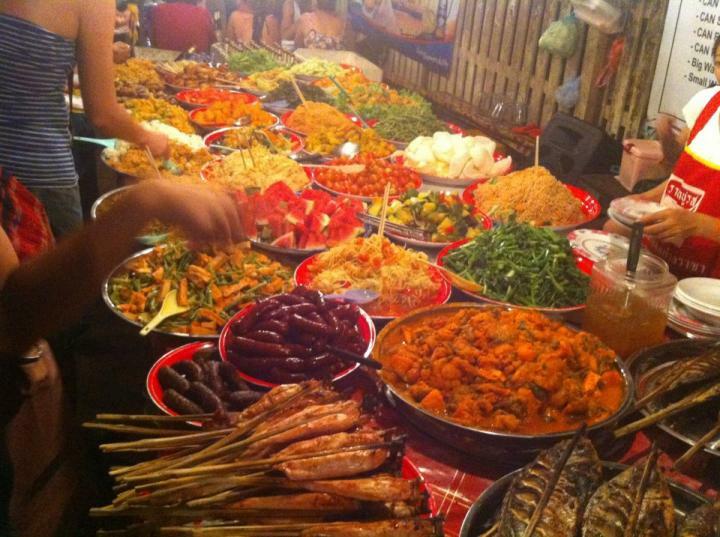 In Luang Prabang we walked around the night market which was massive but they all sell the same things. This one was mostly full of silk scarves and lanterns. We went for a nice dinner along the river side. Most restaurants were outdoors with no fans and we neded fans and it was really hot there. The next day we went for a river tour on a long boat which was nice and relaxing and saw a beautiful sunset. Luang Prabang closes at 10pm so after having a drink in a restaurant bar we done what most do to stay out we went to the bowling alley. It was fun and different to do while you are away travelling. It was about 70p per game and you just have a drink in there. We decided however that Luang Prabang didnt really have much for us to do so instead of staying for the 3 nights we booked we left early after 2 nights and took the 24 hour sleeping bus to Hanoi in Vietnam.